Thank you for visiting The Nigerian Diplomat. This site is dedicated to promoting positive foreign relations & diplomatic activities of Nigeria and the country’s contributions to global peace, security, cooperation, and sustainable development. Diplomacy is a beautiful and increasingly dynamic aspect in the ecosystem of foreign relationships. 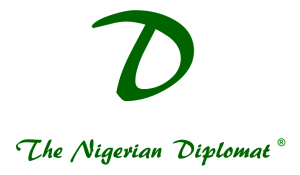 The Nigerian Diplomat since its commencement in 2016 seek to inspire, encourage and entrench the values, principles and benefits of positive diplomacy within the Nigerian context. Our standard has evolved considerably but still, with elements of consistency with our values. Vision: To be the most reliable champion of Nigeria’s positive diplomacy. Mission: We strive towards transforming the diplomatic narrative of Nigeria towards a position of strength based on its value to the world. This is being achieved through various creative channels. These channels include providing factual news updates on Nigeria’s international relations only from the position of its strength of value; export of meaningful songs (lyrics) with Nigerian elements; capacity development through provision of updates on international development jobs/programmes (predominantly in Nigeria); inspection of public policies, insights and strategies within the Nigerian context; as well as the promotion of value inspired role models. The Nigerian Diplomat Travel Guide – aimed at providing reliable and up-to-date data and information on the status of road travels in Nigeria. We also present an objective monitoring and risk assessment on the safety of foreigners in Nigeria. Our Big Ideas: Standards, Reliability, Sustainability and Peace. Core Values: Truth, peace, reliability (commitment, competence & consistency), respect and a valid sense of judgement. We express a deep sense of gratitude to journalists and diplomacy experts all over the world, particularly those that have stood/ continue to affirm the truth. Thank you for your courage, hardwork, persistence, sacrifice and belief as your efforts are core pillars of our work. We lay no claim to the absoluteness of our work rather, we appreciate the efforts of every Nigerian and friends of Nigeria in the nation-building of Nigeria as well as a peaceful world. You are welcome to explore as much as possible on this blog and feel at home! *The Nigerian Diplomat logo is a trademark of United Green Stars Worldwide Limited registered with the Nigeria Trademarks, Patents and Designs Registry of the Federal Ministry of Industry, Trade and Investment (FMITI). Good development to information revolution.Keep it up.